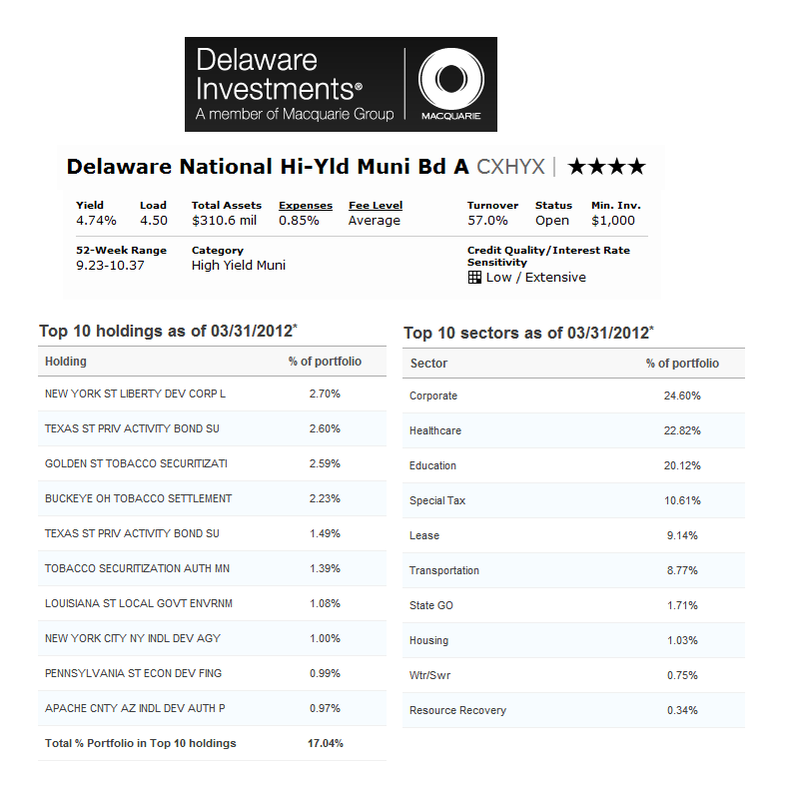 The Delaware National High-Yield Municipal Bond fund (CXHYX) is a top rated muni bond mutual fund. This fixed income fund provides tax free high yield income from lower-grade municipal debts. The investment aim of Delaware National High-Yield Muni Bond fund is to achieve a high level of current income exempt from federal income tax. The fund utilizes majority of net assets to purchase the medium- and lower-grade municipal securities. It will invest its assets in securities with maturities of various lengths with effective maturity between 5 and 30 years. Joseph R. Baxter and Steve J. Czepiel are the current fund managers of this high yield muni bond fund. It was first introduced to public in September 1986. It also has a dividend yield of 4.74%. Its annual expense ratio is 0.85%. The average expense ratio in the category is 1.02%. It also has 12b1 fee of 0.25% and maximum sales charge of 4.50%. Barclays Capital Municipal Bond Index and Lipper High-Yield Municipal Debt Funds Average are the fund’s benchmarks. The 3-year beta risk is 1.41. This Delaware National High Yield Muni Bond fund is ranked with 4-stars by Morningstar. Based on load adjusted returns, it has returned 12.67% over the past 3-year and 5.14% over the past 10-year. The YTD return is 5.11%. The fund’s 1-year best return was achieved in 2009 with 31.54%. The average effective maturity is 11.44 years and the average effective duration is 7.00%. To purchase this municipal bond fund, investors need a minimum initial investment of $1,000 for either brokerage or retirement accounts. It can be purchased from many brokerages, such as JP Morgan, E Trade Financial, Morgan Stanley Advisors, Schwab Retail, Edward Jones, Merrill Lynch, Td Ameritrade Inc, Fidelity Retail Funds Network, etc. The other classes of this high yield muni bond fund are Class C (DVHCX) and Institutional Class (DVHIX). The expense ratio of DVHCX is 1.76% while the expense ratio of Institutional Class is 0.76%. The top 10 sectors of this fund as of March 2012 are Corporate (24.6%), Healthcare (22.8%), Education (20.1%), Special Tax (10.6%), Lease (9.1%), Transportation (8.8%), State General Obligation (1.7%), Housing (1.0%), Water/ Sewer (0.8%) and Resource recovery (0.3%). The top holdings are New York St Liberty Development Corporate (2.7%), Texas St Priv Activity Bond (2.0%) and Golden St Tobacco Securitizati (2.59%). The risks of investing in this fund are Interest rate risk, Market risk, Industry and security risks, Credit risk, High yield risk, municipal bond risk, Liquidity risk, call risk, etc.